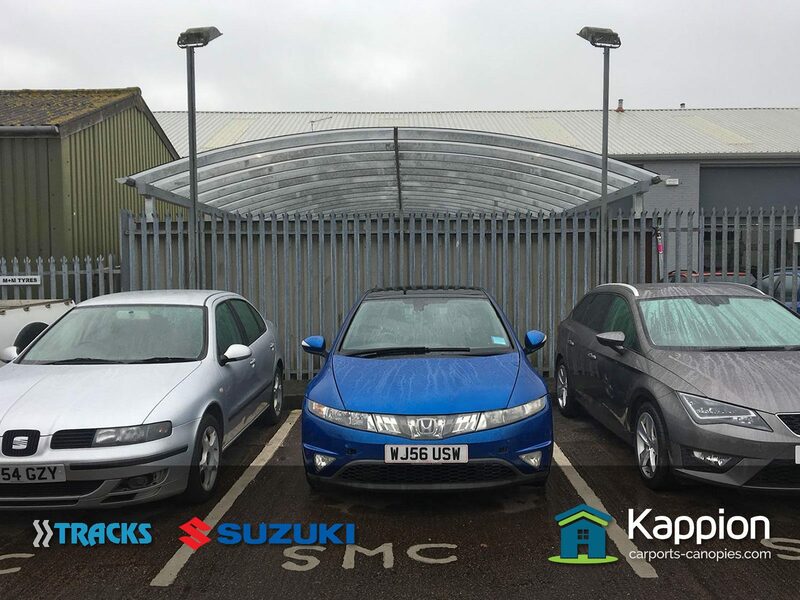 Our customer, Track’s Suzuki in Exeter, wanted to extend their workshop and vehicle valet area with a 104 square metre, large workshop extension canopy. They had an existing steel wall enclosure and the natural thing to do was to provide a shelter over that space and tuck the canopy into the recess above the roller door opening on the building. The result was a dry extended space for the team to work on and finish cars. Our customer had a good look around at what other companies could do but realised that only Kappion could do (exactly) what he wanted and at the right price. After the initial survey, which is performed using our state of the art 3d measuring and modelling equipment, the design was agreed and the engineering drawings produced. Due to the way that we work at Kappion there wasn’t a great deal to check, mainly because everything is so clearly defined in software and on our modelling system. The only issue we had was Track’s had a new drain fitted after the survey so we had to make sure that we could avoid that, which we did with a custom cranked post. The new design had to be agreed and signed off by our structural engineers. Tracks signed the final drawings off and to keep costs down agreed that the structure should be a galvanised finish only. After all the canopy wasn’t customer facing. Clear polycarbonate was chosen for the roof glazing in order to allow as much light as possible into the structure. Once a manufactured date had been confirmed, the project management team arranged a suitable date for the canopy to be delivered and erected. Installation of the canopy was straightforward as the canopy fitted the space perfectly and our professional team completed the groundworks with ease. Our customer was pleasantly surprised at how quickly we erected the canopy. Once installation was finished, we had a final clean down and hand over with Tracks, who were extremely happy with the finished product. The workshop team were over the moon that they had a clean dry space to work away from the elements. 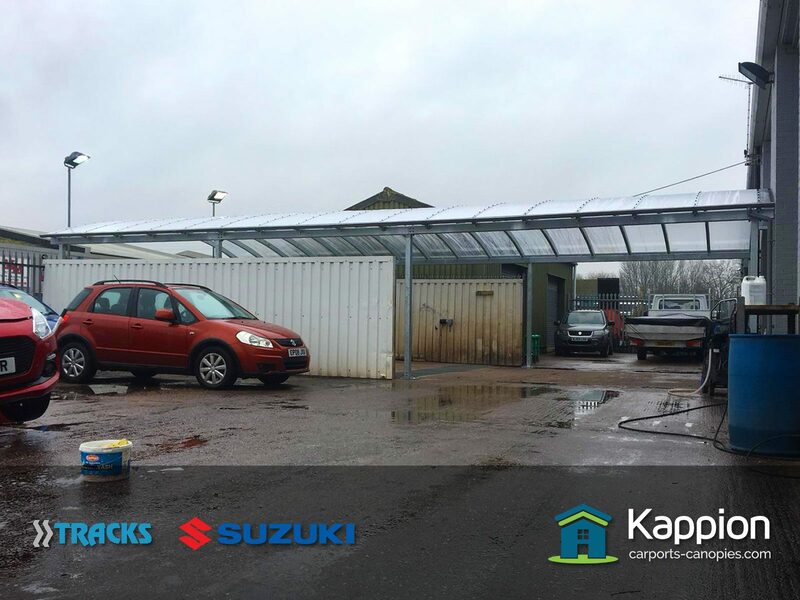 Thinking about purchasing a large workshop extension canopy? If you would like more information please get in touch. If you would like to request an estimate please use our Get a Quote! enquiry page.